View More In Multi Testers. 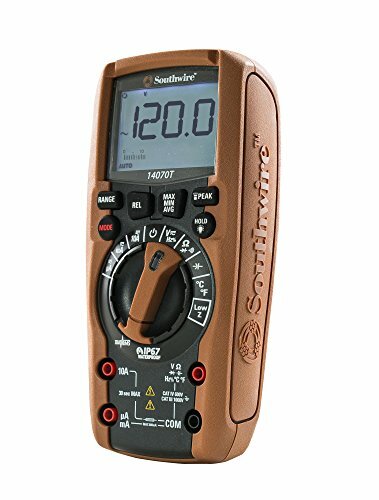 Southwire's 14070T TechnicianPro auto ranging digital multimeter with backlit controls, True-rms, IP67, cat IV 600V/cat III 1000V UL features 12 measurement functions. The 14070T has multiple features that will get the job done quickly and safely, including fully backlit controls, auto ranging, peak hold and more. WHAT'S IN THE BOX: 14070T TechnicianPRO Auto-Ranging TrueRMS Digital Multimeter , Test leads, Temperature probe, Magnetic hanging strap, Carrying case and Four (4) AAA batteries Included. SATISFACTION GUARANTEED: At Southwire, we strive to ensure that every product we develop helps increase safety, improve productivity, reduce manpower, save time and save money - both on and off the jobsite. After all, we don't just want to produce the most products. We want to produce the best products.